Dr. Kotikian is a dual degree(meaning he completed both dental school and medical school) Oral and Maxillofacial Surgeon who completed his dental school at UCLA, then went on and did a one year Hospital Dentistry Residency at the Long Beach Veterans Administration Hospital where he dealt with medically complex patients. 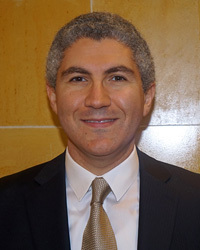 Following his one year residency at the Long Beach VA he moved to Michigan where he completed his medical degree at Wayne State School of Medicine in Detroit, MI, did two years of general surgery and completed his Oral and Maxillofacial Surgery residency at the University of Michigan, Ann Arbor. Dr. Kotikian is a board certified Oral and Maxillofacial Surgeon who specializes in oral and maxillofacial trauma, infections, oral pathology resection and reconstruction, treatmemt of obstructive sleep apnea patients(surgical and non-surgical), and craniofacial anomalies (orthognathic surgery/corrective jaw surgery). In the clinic setting, he routinely performs IV sedations for complex cases including impacted wisdom teeth removal, dental implants, bone grafting and tumor excisions. Dr. Kotikian is a member of numerous organizations, including the American Association of Oral and Maxillofacial Surgeons, California Association of Oral and Maxillofacial Surgeons and the Southern California Orofacial Academy. He routinely lectures on subjects related to his field at both the local and national level. Dr. Kotikian has been featured in the LA Times, Chicago Tribune, Glendale Newspress and many other local newspapers for his work in the field of Oral and Maxillofacial Surgery. Dr. Kotikian has also been featured on CNN Headline News local edition and the Diane Sawyer nightly news on ABC.